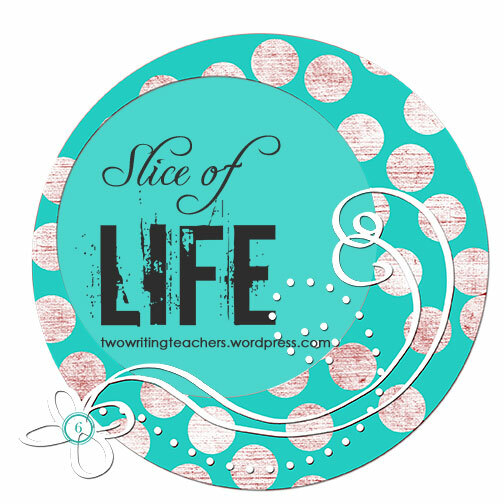 One exciting thing about writing my own blog now is that I can participate in blog events and celebrations like the Slice of Life challenge at Two Writing Teachers. If you want to participate, you can link up your Slice of Life Story Post on Tuesdays or you can visit the blog and read other people’s stories. For more information on what a Slice of Life post is about, you can go here. It might surprise you to learn that I am clothes horse (shoes, too). My conference roommates can testify. I feel more professional and put together when I dress up a bit. Growing up, my mother taught me that when you are “a curvy girl” you need to “try a little harder” when choosing outfits, so that you don’t look like “a slob.” She still expresses her dismay that I don’t wear hose and a slip every day. I am more relaxed at school than I was when I worked in a office, but I want to choose my clothes based on weather, personal taste, and mood–not theme days. At my school, we are expected to participate in school-wide events and celebrations. I know that kids enjoy it when their teachers wear fake mustaches (Mustache Day), slippers (Slip Past Drugs Day), and university gear (Generation TX Week) along with them. It’s fun. The school year is long. Fun is good. Concerned that teachers are weary of the endless theme days, our administrators have offered an additional perk. If we participate, we can wear BLUE JEANS. I’ll wear anything to school if I can pair it with blue jeans. Said no teacher ever. We still can’t find the Charlie Brown shirt. I look at the mound of school shirts spreading across the floor–field trip t-shirts, Field Day t-shirts, UIL Team t-shirts, blood drive t-shirts–all shirts I only wear for school, usually once on the day of the event. Since I am looking for my Christmas t-shirt in here, I must have classified it as a school-only shirt, too. Frustrated with the entire exercise and running out of time, I decide to opt out of Christmas Attire Day and suffer my colleagues’ ribbing all day because I ‘m not participating. I am sure someone will take pity on me and loan me their extra elf hat. I can’t tell you how excited I am about this. No really, I can’t tell you. I think teaching should be fun because teachers enjoy the work we do. If the only enjoyable days at school are the days we could wear our pajamas, there’s a problem. Perhaps, I just resent the loss of one of the last pieces of autonomy many teachers still have–the ability to choose what we wear to work. My husband and I worked our way through school, taking low-paying food service and hospitality jobs. I have done my time wearing the same clothes as my co-workers. I want to wear my nice clothes. This entry was posted in #Slice2013. Bookmark the permalink. Second, I totally get where you’re coming from on the themed days. There are other ways to make school enjoyable for kids than endless theme days. Perhaps you and a few other like-minded colleagues can band together and have them reduce the number of them for next year. To like five. Total. Gotta love those theme days! My favorite are pajama days! What professional wears her pajamas to work?! Glad you are blogging! And slicing! Well, thanks for starting my day with a big smile, Donalyn! I refuse to participate in theme days, too – and I don’t think I could ever teach in blue jeans. Old fashioned, I guess! Thank you for joining us to slice on Tuesdays – and, the new blog looks wonderful! (Hey, there’s your bit of Christmas green!). Amen, sister! I abhorred those theme days too! Thankfully I’m retired so I don’t have to participate any more. It seems like your school has gone way overboard. So glad you are joining in on slicing, welcome! I’m with you! It makes me feel better about my feelings about those days having you say it, too. Thanks! I love theme days in middle school. We do not get very many, so when we do, it’s a big deal. Ugly sweater is December 13! I was a new staff member in a school in Concord, MA, and all the teachers told me they dressed up as Minutemen for Patriots Day (celebrated only in Massachusetts). I arrived at school dressed in knickers and a vest–the only one in costume! and realized I’d been “pranked”. The students loved it, however, and I got points with them for being a good sport. Welcome to slicing on Tuesdays. My eyebrows were about to shoot off my face. 14 theme days? You have to participate? I always thought that these days were for students and teachers could participate if they wanted. I loved the mixture of t-shirt choosing and thought sorting, and all ending with tiny bit of green in your sweater. I am all about comfort, so I enjoy the theme days and any excuse to wear jeans, but I generally don’t do the crazy hair. We have a week of theme days for Homecoming, but not many others. I jump at pajama day, but I hadn’t thought about those who wouldn’t enjoy it. Our staff participates or doesn’t and nobody fusses at the non-participants. Glad you shared. I might finally start slicing. Thanks for the inspiration. 🙂 This post is really fun. Finally someone like me! Unfortunately I teach at a school that has many teachers who are motivated by the chance to wear jeans, It’s frustrating that admin has learned that such a little thing goes a long way. I’ll keep wearing my nice clothes. You? A clothes/ shoe horse? I’m shocked. 😉 Love your post. I love this post – I never participate in theme days anymore either. I’m over it. I’m glad you are, too. I’m also a clothes/shoes horse (maybe it’s a nerdy thing?) and I’m so happy we only have 4-5 themed days each year. They are usually clumped together during Spirit Week and as a class advisor it can be fun. But it sounds like you have 2-3 each week! That’s ridiculous. I just want to wear my nice clothes! I never enjoyed theme days as a student, and I still don’t as a teacher. Ouch! Live me some low key theme days. I love my job, love my kids, love the work, but the days I can rock a thematic tee shirt are days I look forward to! Then again, at the high school level these are few and far between. Good read though…thanks for sharing. Holy moly! That’s a lot of days! Welcome to Slicing! I can’t wait to read your posts! No surprise, you have captured the underlying issue with theme days and done so so eloquently – “Perhaps, I just resent the loss of one of the last pieces of autonomy many teachers still have–the ability to choose what we wear to work.” Agreed! I always “dress happy, ” what ever that might be for me each day. This made me laugh! I HATE costumes, theme days, dress like your favorite_____etc., and thought I was the only one. I’m glad I’m not. 😉 I like fun almost any other way! I was once asked in an interview how I felt about dressing up in costumes. In the moment I thought it must be some deeply philosophical question that they were going to use to assess my belief system or something. No… They really wanted to know how I felt about dressing up in costumes. We did it all…the…time. Blech. It’s difficult to teach and be taken seriously by parents when you are dressed in princess attire (which I personalized by making myself a RODEO princess), as a witch, or in your best black cat costume. I work somewhere else now, quite happily wearing actual clothes every day.